Light and fluffy sourdough waffles are easy to make and blow away regular waffles with their flavor. It’s a great way to use up your starter, too. One of my favorite things to make with the sourdough starter I keep alive by storing in the refrigerator is sourdough waffles. When I first started out growing and using sourdough starter, I had a pretty rough start to making artisan bread, which got a little better here and then achieved sourdough artisan bread perfection here (it’s such a good recipe!). And then I made Belgian sourdough waffles with the starter. Oh my goodness, how I LOVE them! I cannot tell you how much. And guess what? They are 100% whole wheat, yet light and airy with crispy edges. Um…yeah, can you tell I’m still a little smitten? What’s weird about that is I’m not a big waffle/pancake fan normally. But these sourdough waffles were crisper than any others I’ve tried (and I always make yeast Belgian waffles when I do make them), and had a wonderful flavor that is hard to describe. Yes, a little sourdough, but not too much. In fact, I was the only one of our family that said I could taste the sourdough. Can I just tell you what a thrill it is seeing all this action in sourdough starter I grew myself? It’s beyond cool and I just do a little happy dance when I see all those bubbles working after sitting out overnight. 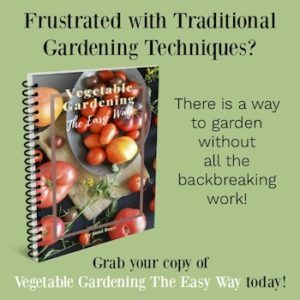 It’s sorta the same feeling I get when I see the first seeds sprouting or when I serve a meal made only with our garden produce. There’s the feeling of accomplishment and amazement, for sure, but also that I used something in nature (in this case, wild yeast) to create food and feed my family. 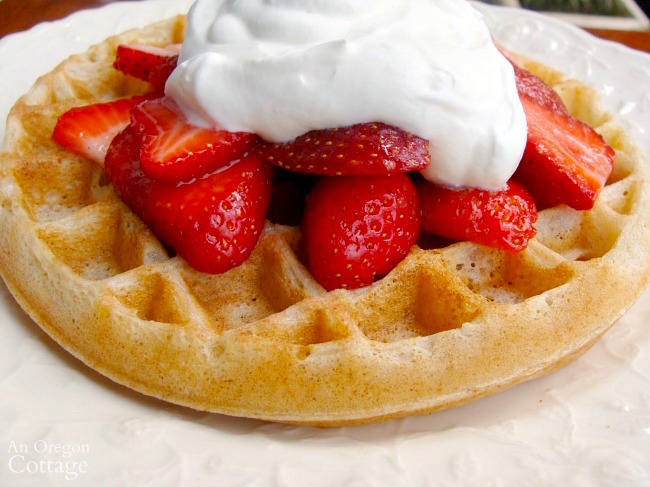 While I show the waffles with strawberries and whipped cream (love), they are equally good with traditional maple syrup. Our family likes to smear peanut butter on first and then drizzle it with real maple syrup – it’s a great flavor combo that ups the protein count, too. 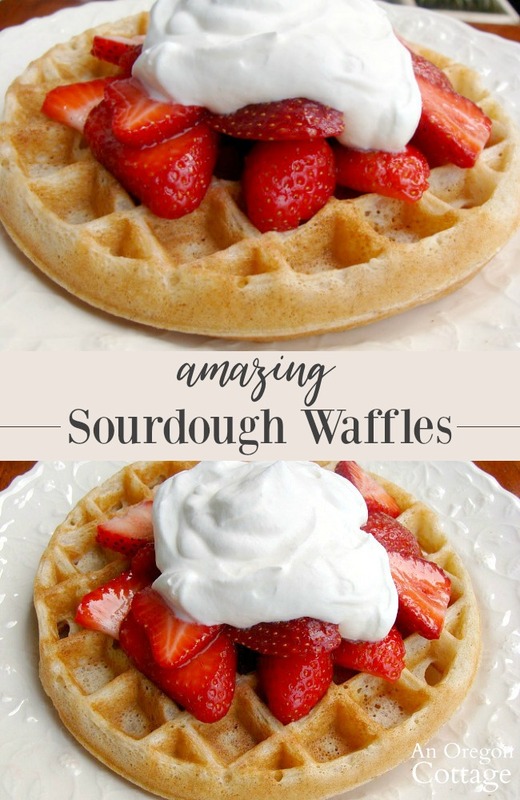 Click the arrow for the full sourdough waffles recipe (with print options)! I have a 10 year old starter, I come and go with new science looking for how to make my sour dough have more sour flavor. Nothing like the taste of San Francisco or Alaska sour dough bread, I live in Michigan and have little success with the increase of flavor, some say it is the difference in natural yeast cell. I have tried vinegar in the dough to amp things up, also citric acid powder from King Arthur. 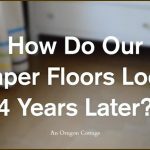 Wondering if you can help? I’m with you, Lisa – I always want more sour flavor, too (I’ve read some don’t want any sour flavor!). I’ve had luck leaving the bread mixture to sit overnight, either in the fridge or counter, after mixing it all up. It takes more planning, but the bread is usually more sour. Have you tried that? Just make the waffles! So good. My picky 5 year old declared them the best waffles ever! And he normally will not touch whole wheat waffles. My question is that I have a very large family and these do not go far. Does the recipe double or even triple well? 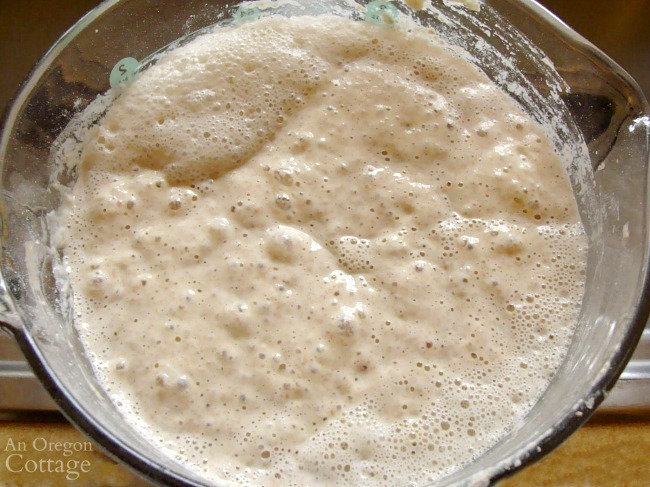 Do you have any insights as to why the baking soda in every sourdough recipe for waffles, but not a quick-acting yeast recipe? thanks! Well, I’m about to experiment. This a.m.s batch was a whole wheat starter, but King Arthur unbleached white, organic. Today I mixed a new batch with 1 part whole wheat, 2 parts KA white. 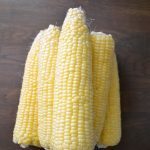 (I’m halving your recipe… it’s just me.) The whole wheat (Bob’s Red Mill) is because it tends to trigger the yeast better. Tomorrow morning, I’m making a batch without any baking soda at all. I’ll update here. BTW, I’m in PNW as well. So happy the rains have started! Oh, thank you – I will be curious to know the outcome! And yes – it was nice that the rain was able to put out much of the major fires. I think this weekend’s forecasted rain may put out the smolders that are left! I did experiment today. 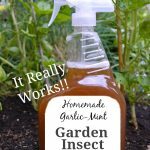 My recipe from another site is very similar. Obviously, we need a “fed” starter that has been allowed to fluff up overnight. But I did omit the baking soda completely.When I folded in the “morning” ingredients, I was careful to not deflate the risen starter. The waffles were as fluffy as they were with the soda. That was what I was hoping for! Now on to sourdough bread!!! Thanks for the insights and encouragement. This is great to know, Meryl – thank you! 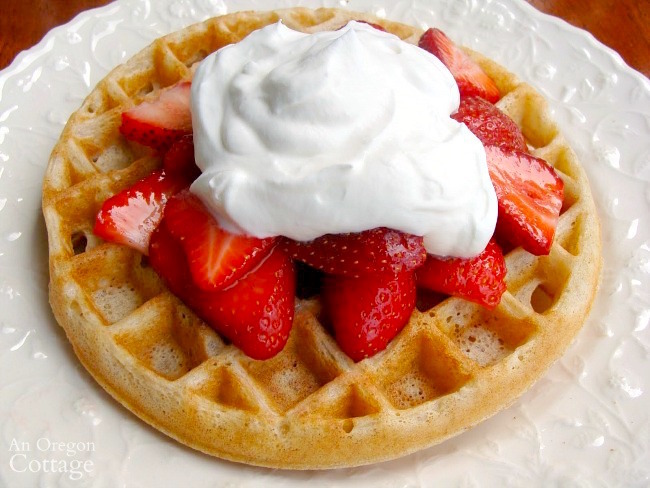 These waffles are very good; I’ve made them numerous times. They aren’t, however, 100% whole wheat. The starter would have to be whole wheat in order for them to be 100% whole wheat. I recommend that you try them – they are truly delicious. I’m so glad you like these, Sandie – they are so good and a great way to use up starter. 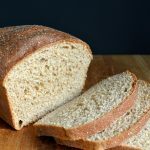 My starter has always been made with whole wheat, so these are 100% whole wheat when I make them. Thanks for responding. I use regular sourdough starter so mine aren’t 100%, but am working on a whole wheat starter. These are sooooo good! I just mixed up the batter for these waffles, and I’m wondering what the consistency is supposed to be? Is it supposed to be a batter you can pour onto the waffle iron? Like regular waffle batter? Mine is insanely thick… Like as I mix it it just stays a ball of dough. Thats probably because our sourdough starters are different consistencies (some hydrate 100%, some less, some more…)- feel free to add more water (or milk) to get your batter to a pourable consistency, Anastasia. Hi! Making my first batch of these waffles! They look super tasty! Do you cover and leave the batter sit out at room temperature? 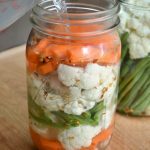 Or do you cover and place in the refrigerator overnight? You leave it on the counter so the sourdough yeast can work it’s magic (putting it into the fridge will make them go to ‘sleep’). Enjoy! If I were to halve the recipe, would you recommend using 1 egg or 2? I never know what to do with eggs. Alternatively, do these freeze well? I have a week-old apple sourdough starter that I’m dying to try in a recipe. I’m glad I read your tips not to attempt bread with it until a few weeks of feeding! I would have been devastated if my first bread attempt had fallen flat! I usually don’t have luck with halving recipes that call for an odd number of eggs, Jenny, but if you really wanted to, I’d probably do 1 egg and the whites of another egg. These do freeze wonderfully, though, and my kids love to reheat them in the toaster oven on school mornings. Oh, and I would’ve stopped baking long ago if I let baking failures get in the way, they happen all too often on your way to learning -or at least they did for me, ha! Do you think they would turn out less sour if I mixed half of the flour into the starter overnight and mixed in the other half in the morning? Or would that backfire and just make it more acidic? Wow, my daughter always complains that my starter is never sour enough, lol. Using newer starter usually means less sour, so your idea may work – give it a try! So glad to hear it, Lana! And thanks for the vegan substitutions, too. Rachel- Yes, I keep my sourdough kinda thick so it’s not as strong (at least that’s what I’ve read :-). Too bad your hubby won’t switch (but your buttermilk one does sound good!). We just ate these waffles for breakfast this morning… they seemed a little darker than what you pictured and we could deffinately taste the sourdough flavor (maybe honey would have softened it more than the sucanat? or perhaps my sourdough is just STRONG), still they were pretty yummy with some good butter and real maple syrup. All in all a good waffle, however my husband isn’t ready to switch from our usual buttermilk recipe (using sprouted spelt and rice flour). Which is too bad because this recipe is so much easier! 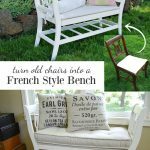 Thank you for a lovely and enjoyable blog! Melinda- I’ll be waiting to hear how it goes for you! Yum. That waffle looks wonderful! Thanks for sharing your recipe and linking to Tempt My Tummy Tuesday. 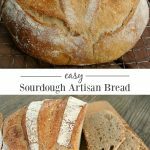 Sourdough is one of those things I really want to master – my husband loves it! 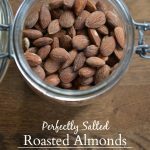 I’ve bookmarked this recipe – stay tuned!